It is so funny how our tastes change as we get older. As a child and even teen you would never catch me eating spinach. Yet somewhere in my adulthood I discovered how delicious it is. I love it in a salad but my favorite way to each spinach is sauteed. My father has a couple of restaurants in Bronxville (New York) and whenever he comes up to visit he always brings us a few trays of yummy food. They make the most delicious sauteed spinach ever and I decided one day that I was going to try it myself. So I took my organic spinach from our CSA and gave it a go. While it wasn't a complete fail it did taste pretty bitter. So I emailed dad to find out what his secret is and he told me how they cook it to perfection at the restaurant. Following his instructions I made the yummiest sauteed spinach and I can't wait to make it again. I am sharing his secret below, enjoy! 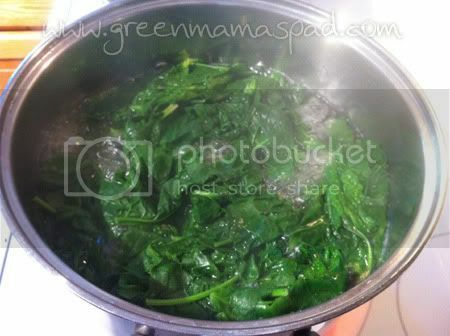 Bring a large pot of water to a boil and add the spinach. 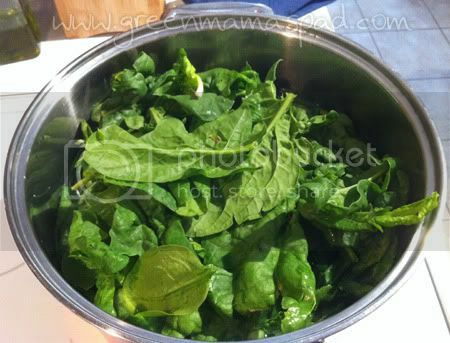 Stir it for a few minutes till all of the spinach leaves start to wrinkle a bit. Drain and set aside to cool. I rinsed with cold water to speed up the cooling process. 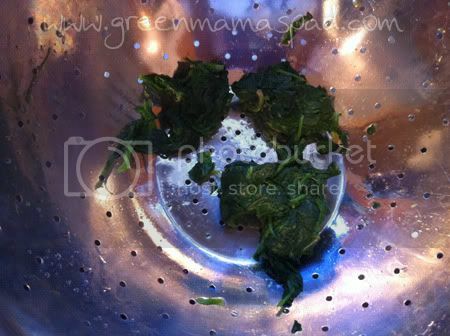 Then squeeze all of the excess water out of the spinach. Like you are wringing water out of clothes. Keep going so you can get as much water out as possible. The less water you have then the less bitter the taste. You will be left with a few clumps of spinach. 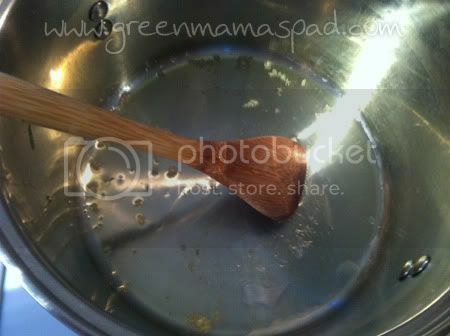 Return pot to stove and over medium-low heat add some olive oil and garlic. How much garlic depends on your tastes. Saute garlic for about one minute. 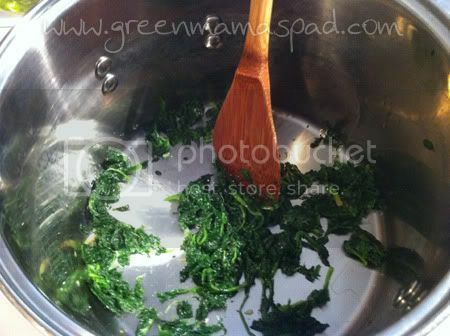 Add the spinach to the pot and saute for roughly four minutes, constantly stirring. The spinach will separate and no longer be in clumps. Add salt to taste. Time to plate and serve! 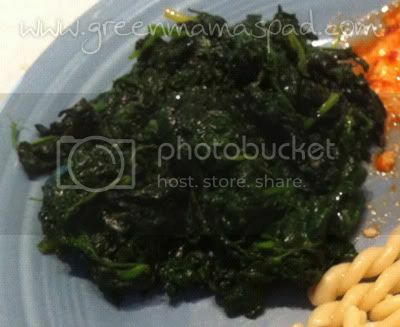 This sauteed spinach goes great with a saucy/cheesy main dish like chicken parmigiana or chicken rollatini. Tip: A large bunch of spinach will reduce down to pretty much one or two servings. So if you are cooking for a group, use A LOT of spinach. You know what? A lot of people knock spinach, but I really love it. Thanks for the recipe, I will have to try it! 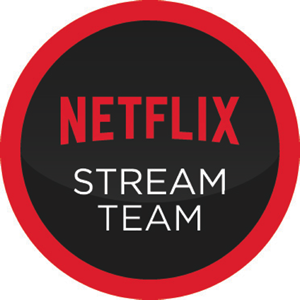 I would absolutely love this. I am crazy about spinach. I hate having to clean it because it's soooo sandy, but I love the taste! We love spinach! Thanks for sharing the recipe.